So You Hacked Our Site!? Not too long ago, I added my company, Inedo, to the federal government's Central Contractor Registration system. I don't know, I just didn't want to miss out on all the fun every one seems to have with government work. Whenever one signs up for virtually any government thing, a deluge of companies somehow manage to find to out. The CCR is certainly no exception. FSG Rep: Hi Alex, I've got some great news for you! FSG Rep: We've reviewed your CCR registration, and it looks like your company could be eligible for placement in our guide! FSG Rep: The Suppliers Guide! It's used *exclusively* by state and federal agencies to purchase services and products. Anyway, to confirm your eligibility, I'll need to ask a few questions. First, where are you located? FSG Rep: Okay... well, let me punch this in here -- clickity clickity clicky -- wow! This is really good! You are, in fact, eligible for the guide! Would you like to be in our guide? Me: How much is the nominal fee? FSG Rep: Heh, it's really very little actually. It's a fantastic investment that ranges anywhere from six hundred to several thousand. Me: I can't make that decision right now; can you send me over some information? FSG Rep: Oh. You can't? Well, I mean, I guess I could send you more information... but you know, I can just answer any questions you have now. I mean, I'd hate for you to lose your eligibility, that's all! Me: I guess we'll just have to take that risk; can you also send me a copy the guide, too? FSG Rep: Err, gee... well, you know... that's the one thing I can't do. You see, these guides are to be used *exclusively* by government agents. We can't just give them to anyone, you know. Me: Okaaaay... just send me what you can then. After a bit more back-and-forth about how he could "just answer any questions I had right now", the sales rep pointed me to their sample ads, a 7mb PDF with sixteen pages of seemingly real companies, all with the same phone number (555-555-5555) and the same website (00000000000.com). Somehow, that didn't convince me to "invest" several hundred dollars, so the salesman faxed over some more inforation with a single, real ad. And sure enough, following that URL (UPDATE: now taken offline) led me to the "SECURE Federal Suppliers Guide Listings for Agents" [sic] page. Having obviously way too much free time on my hands, I clicked through the secure guide and called a few of the companies listed to inquire about the ad. The response was overwhelmingly the same: we spent several [hundred|thousand] bucks on this ad, and haven't had a single call -- aside from yours just now -- in [one|two|three] year[s] regarding it. FSG Rep: You can't access that page! That's for Federal Procurement Officers Only! It's password protected! FSG Rep: So you hacked our site!? You can't do that! It's SECURE! You can get in a lot of trouble for hacking! The conversation quickly went downhill from there. Needless to say, I decided against investing in the guide. But the good news is, despite hacking their site, I'm still eligible for inclusion in the guide! It was taken offline a few minutes ago, probably in response to all the "hacking" that's been going on. 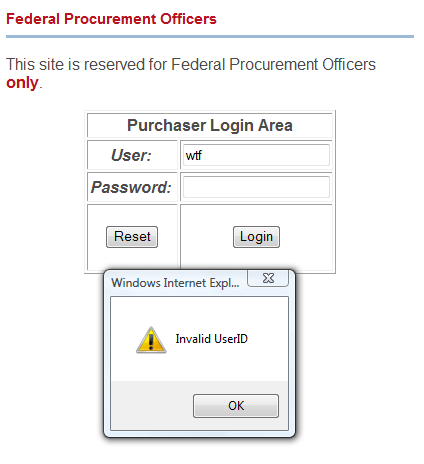 thank you hackers for trying to destroy federal suppliers guides reputation. i have worked here with my wife for 10 years now and have helped hundreds of clients obtain federal government work. i have 4 children and though you don't care you are hurting the feelings of many good employees and customers by your immature actions. sorry our site wasn't protected to your standards however all of you are being reported to the appropriate authorities as we have your information too. you should of protected your info a little better. not only is the company legit we actually have held a 5 year GSA contract with the federal government and one of my best clients just broke 500,000 dollars in federal sales directly related to the GSA contract we got them. i am proud to work here and help small businesses obtain government workand also help federal buyers locate qualified small businesses to do business with. if you not interested in government work or our services of helping small businesses navigate the federal market fine but please don't slander the company. its rude, your comments are not truthful we are not a scam and i hope someday you realize that all you have to do is check us out with dun & bradstreet or GSA or the florida local and state chambers of commerce to see that what we do is real and federal buyers do request both our hardcopy guides and the online directory as well. // **** You WILL NOT get access without a valid password **** var suffix = ".html"
Don't worry... you can still get in using a google search. That way you don't have to "hack" the site by using the password "listing" that someone was kind enough to find for us. Apparently these people have learned their lesson. Out of curiosity, I checked their new login page here, and tried to enter, without success. In fact, without any effect at all. So I checked the source for that login page... and aside from some weird nested tables in the login form, the real novelty is that it lacks an action entirely. Click that login button however many times you want, the form will never be submitted anywhere. Now THAT is what I call unhackable. Of course, it's also bloody useless.